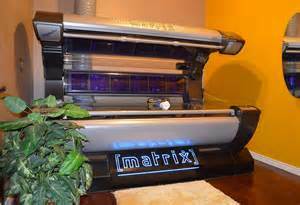 Providing state of the art tanning beds and carrying the newest tanning products. All salon attendants are knowledgeable to create a premium tanning experience in Durango, CO.
Come try out our stand up bed! It is a 9 minute maximum bed and our packages start at $14 per tan. The Gold bed offers a 15 minute maximum tanning time and includes an air shower to keep you cool while tanning. 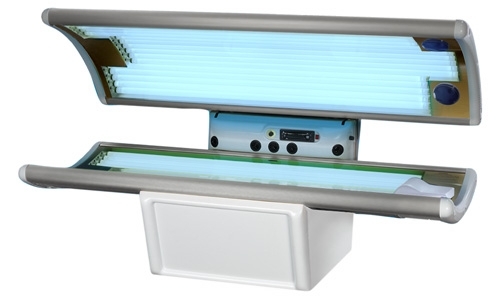 This bed is equipped with 3.5% UVB to develop a base tan for new tanners, while the bulbs are considered a "level two" at most tanning salons, ensuring a lasting bronze tan for year round tanners as well. 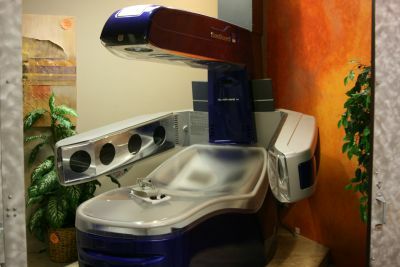 The "Sunboard," is a complete high pressure tanning lounge. The Sunboard lamps produce almost 100 percent UVA light, which is the light that causes pigment darkening, or more simply put, tanning, while reducing the risk of burning, drying of the skin, and fine line wrinkles. The Sunboard is unique in its open design, providing maximum comfort and maximum results. The Sunboard has a 20 minute maximum exposure time. The high pressure Matrix tanning bed combines high pressure quartz lamps with a tremendous filtering system to insure you receive 99% UVA tanning rays. High pressure lamps produce UVA & UVB in different ratios than conventional tanning beds; just enough UVB to produce the melanin required to tan and a lot of UVA to oxidize the melanin and turn it golden brown. Rotating lamps and mirrors will ensure an even tan. This bed has a 15 minute maximum exposure time.